Sandy Felton looks at the advantages of having stone or brick walls in your garden either as boundary material or as decorative features. There are numerous ways of forming boundaries to gardens and usually they are already in situ when you move into a property. There may be some sort of wooden fencing, hedging, or decorative panelling or there may be stone walls of one description or another. In my case we inherited some lovely dry stone walls, typical of Cumbria, that have stood the test of time and are now liberally covered in lovely moss and lichen. They need virtually no maintenance so that’s another bonus. Obviously, the type of walling you might choose will depend on your location, type of property and garden and in some cases how you want to use your space. You might want to have raised beds built of stone, or use it to create borders, on the other hand you might want to create a little bit of fantasy by having an arbour or mock ruin, the possibilities are endless. 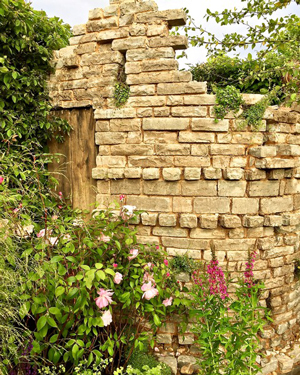 There were some excellent examples of dry stone walls at the 2018 Chelsea Flower Show where they were used on the Welcome to Yorkshire garden designed by Mark Gregory and on the Warner Edwards garden designed by Kate Savill and Tamara Bridge. 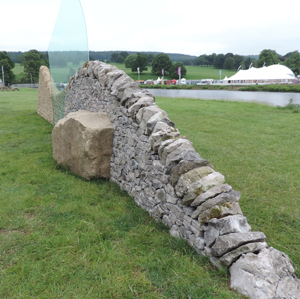 I asked Chris Bratt, of the Cumbria Branch of the Dry Stone Walling Association of Great Britain, about the advantages of this type of wall in a garden. Chris explains that in areas such as Cumbria and in others areas where stone walls are an integral part of the landscape, dry stone walls will fit naturally, unlike mortared brick or block walls: “If a wall is properly built, it will require no maintenance and will last hundreds of years,” he says. “Compare that to fences that rot and need continual care. You might want to consider that boundary walls to your property may need to be stock proof (about 1.5 metres high to prevent all but the most agile sheep jumping over, but not deer). They certainly make a fine looking boundary,” he adds. Chris also points out that lower border walls for flower beds must be built to the correct dimensions – one stone depth is not sufficient and for maximum strength and soil retention, he recommends they should be at least 30cms wide. Dry stone walls also offer havens for wild life – a wall will encourage moss, ferns and lichens; toads, frogs, slow worms, wood lice and bees. However, he recommends that you ensure you keep ivy off dry stone walls as it’s a killer and will bring a wall down. For training courses in other parts of the country contact information@dswa.org.uk or phone 015395 67953. 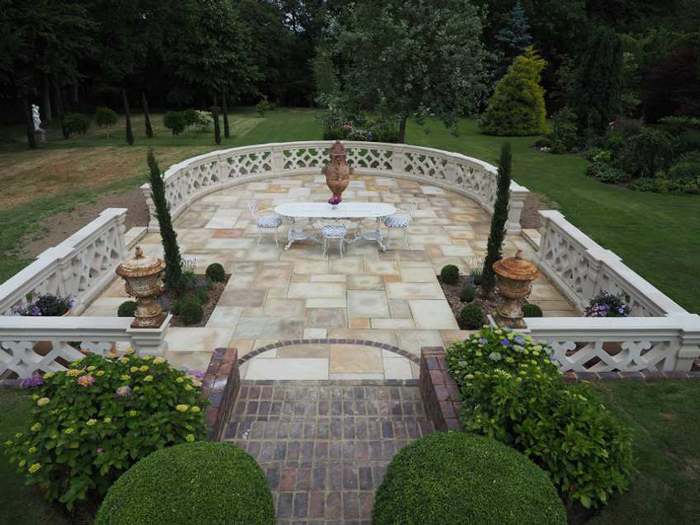 Stone is also effective for patio design and pathways and there are plenty of manufacturers now producing some really lovely designs to enhance any garden. 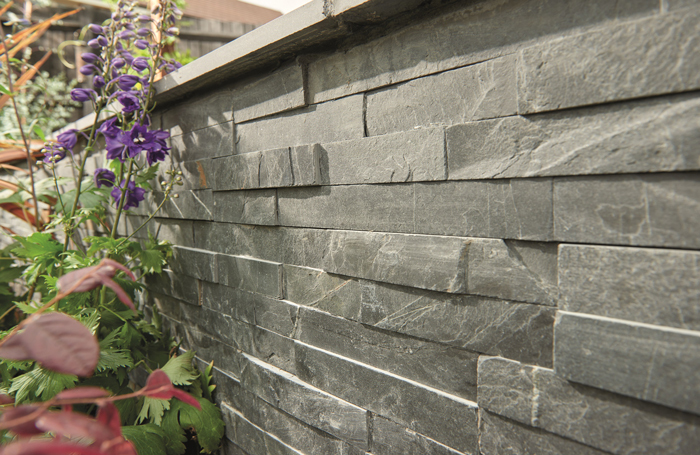 Obviously, any type of walling can be expensive but if you are looking to refresh your outdoor space and don’t have the budget to completely start over you should look at stone products available from manufacturers such as Bradstone. They have introduced Natural Stone Walling Slips to offer a quick and easy solution to transform any old, tired garden wall or area. Walling Slips (pictured below) can offer an instant update by adding stylish shape and structure to your garden design and Bradstone can offer these in six shades including natural sandstone, smooth sandstone, silver grey or natural slate. The natural slate and natural sandstone slips are Z-shaped giving the appearance of a random look while the smooth sandstone slips are individual blocks in a mix of sizes to give a more formal contemporary look. Howard White, Operations Director & Health & Safety Manager at CED Stone points out that there is something to be said about the history of stone walls: “From the southern edges of England to the northern tip of Scotland, the local stone has been effectively used to define boundaries, enclose livestock and in its earliest form to keep the wolves at bay! The Yorkshire Dales alone has over 5,000 miles of walling dating back to the early 12 century. Natural stone walls define the landscape, moving with and surviving the seasons. 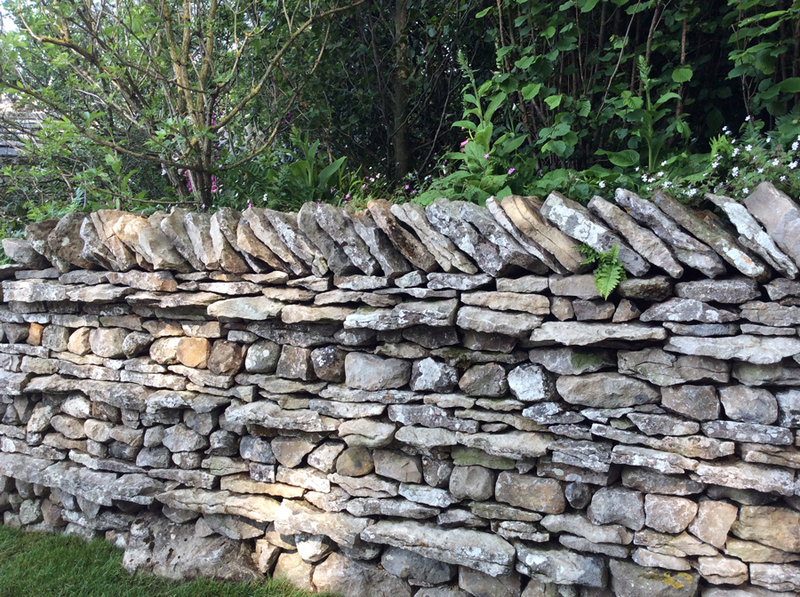 “Bringing stone into the garden as walling gives many advantages, not just it’s beautiful appearance. Laid dry it creates many nooks and crannies, providing both planting opportunities, and homes for wild life. Stone has that natural ability to age with an air of maturity and when fashion or design dictates, can be reclaimed and used again,” he said. He explains that stone cladding is the modern take on walling, bring the stone appearance with many of the benefits, while suited to the modern landscaping installation method: “These quick and easy to use systems open up stone walls to a whole new market place and are achievable by most landscaping firms” says Howard. “Whether you opt for a drystone wall or a cladding system you will bring definition, beauty and interest to any garden space,” he continued. Chilstone make a wide range of balustrades that can be joined to make a low stone wall like feature. (pictured below). These look good around swimming pools or along staircases and terraces. If you have broken or crumbling stone urns, planters or ornaments, Chilstone can cast a mould from the existing piece and make a replacement. A good example of this are the urns that adorn the roof of the Temperate House at Kew. Kew’s urns were put into storage during the Blitz but were forgotten about for decades and many were broken or stolen. Replacements were able to be made by Chilstone. Another good use of stone is when it is used for benches – they can bring an empty corner of the garden to life, make a focal point or act simply as a place to sit and rest while enjoying a favourite view of the garden. They age well and as Chilstone point out they can weather to a distinguished patina. Stone benches, statues, urns and other pieces can increase in value with age and have been sold at Sotheby’s. As autumn nights draw in, now is a good time to appraise the use of stone in your own garden. There is certainly plenty of scope to incorporate stone in even the smallest plot and it will certainly add beauty to any garden space. 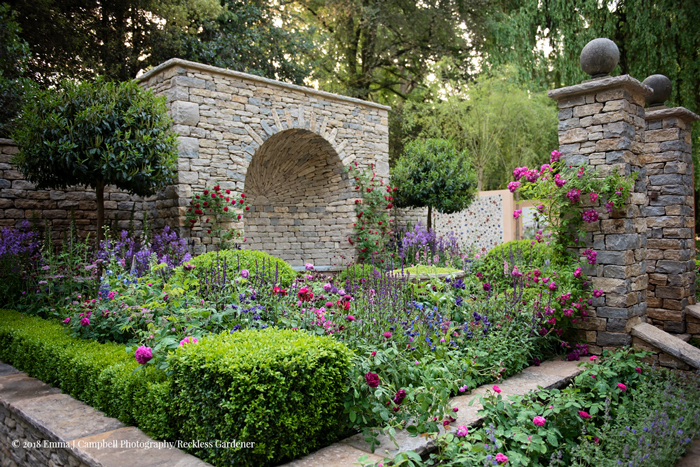 Photo credits: Banner, Wedgwood Emergence and A Very English Garden ©Reckless Gardener 2018, credit Emma Campbell Photography; Walling slips ©Bradstone; Black Slate ©CED Stone; Balustrade ©Childstone; Romance in the Ruins ©Claudia de Yong.